Accomplished Miami Songwriter and Composer Shows Off Her Sultry Voice and Musical Training with Debut Single Worthy of Industry Veterans. 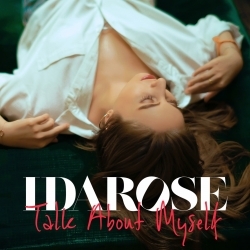 Miami, FL, October 09, 2018 — Building upon her success as a songwriter and composer, Idarose releases her debut single Talk About Myself, demonstrating a rare combination of vocal talent and musical maturity. Major artists and record labels have already taken notice of Idarose’s musical talent, and audiences are sure to agree that Idarose is destined to make a major mark on the music industry. “Idarose takes a refreshing approach to her music by pouring her soul into every detail, while paying careful attention to developing a sound that is familiar, yet all her own,” says DJ GQ of Y-100 in Miami. Talk About Myself takes a sweet, yet powerfully honest look at the real Idarose. Its message is one of empowerment and acceptance, embracing the beautiful flaws that make us all human. With a sharp ear for sound and a talent for elegant expression, Idarose’s mission is to create music that is pure and special – easy to listen to and hard to forget. Currently attending the prestigious and eclectic Frost School of Music at the University of Miami, Idarose loves to work with all different types of writers, producers, artists, filmmakers and creative minds to make great ideas come to life. Right in tune with the most popular current artists and sounds, the buzz around Idarose is electric, and Talk About Myself certainly lives up to the hype. Q-Music Group is a music production and promotion company based in Lauderhill, Florida, which is managing the media and marketing for the release of Talk About Myself. Over the past decade, Q-Music Group has contributed to the production and promotion of music in the genres of hip-hop, reggae, rythmic, Top 40, EDM, and pop.